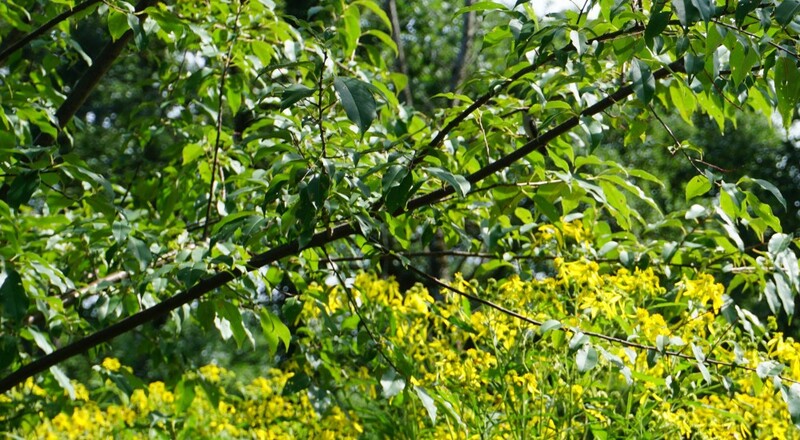 Can you find the hummingbird in this photo? 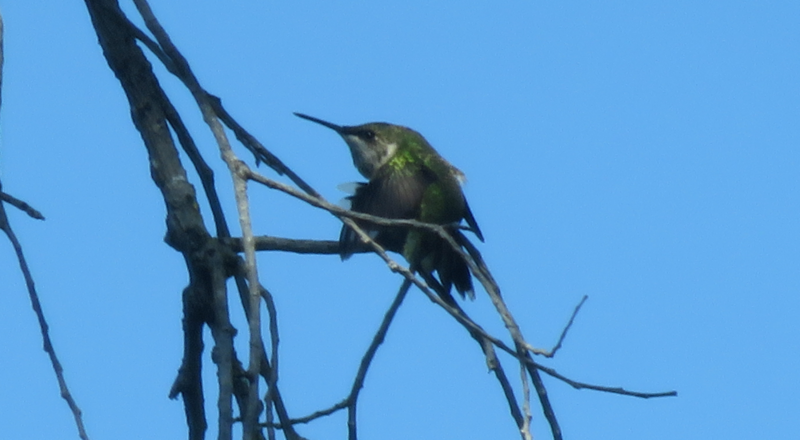 Hummingbirds are often easier to hear than see! Found only in the Western Hemisphere, hummingbirds are one of the largest bird families in the World with approximately 320 species. 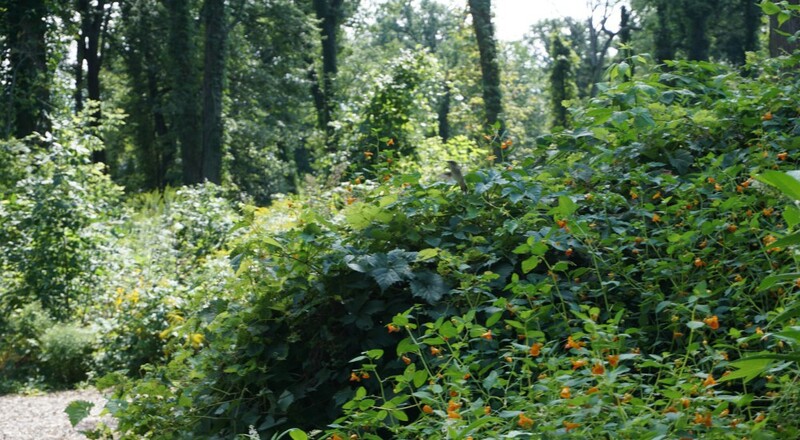 Of these, 150 have been seen in North America but less than 20 species nest here. 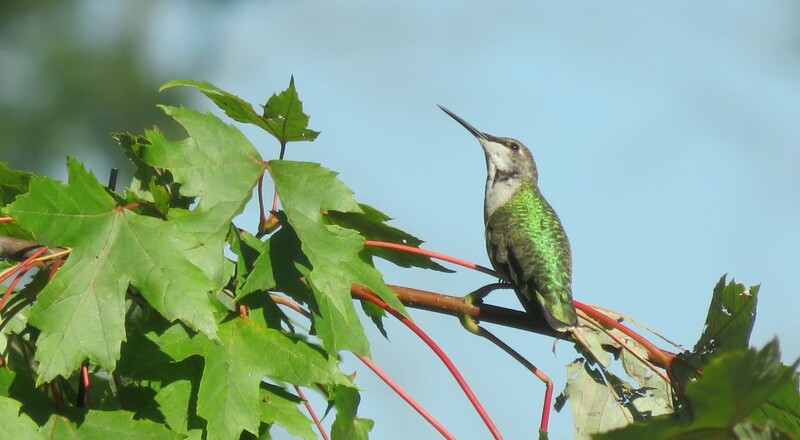 The Ruby-throated Hummingbird is the only species that nests east of the Mississippi and is, therefore, the only species you will likely see in Crow Island Woods. They begin arriving by the first of May and leave for southern Mexico and Central America by mid-to late September. 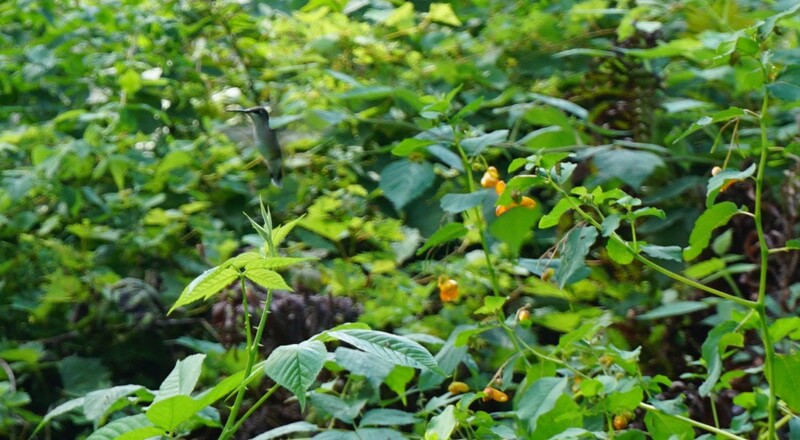 Ruby-throated Hummingbirds are attracted to orange and red so you can often find them feeding on nectar from cardinal flowers (prairie) and on jewelweed (woods) found in Crow Island. 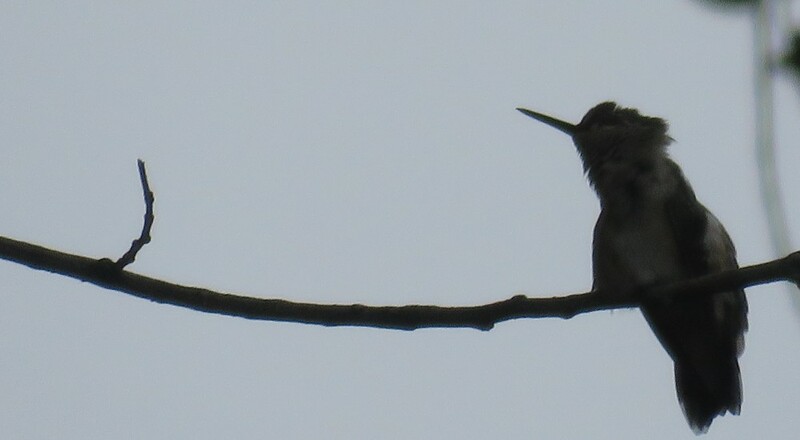 If you look carefully, you may also spot hummers resting or preening on twiggy branches in dead trees. 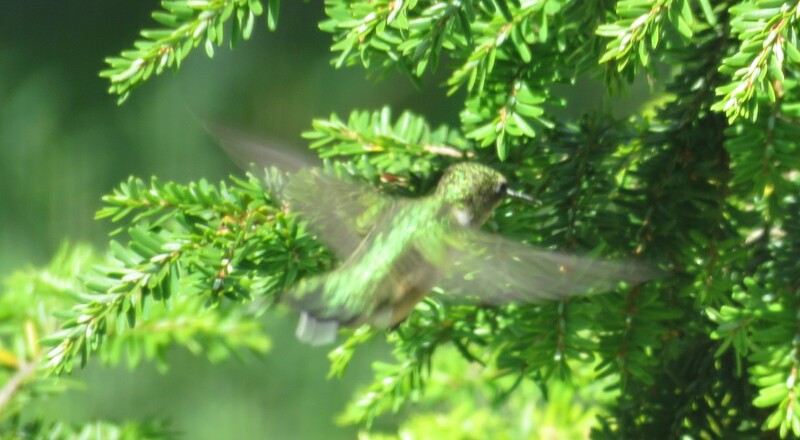 Like nearly all North American hummingbirds, the males of this species have iridescent green feathers and a bright throat patch. Females and immature males are duller overall and lack the ruby patch. Hummingbirds are a unique family in a number of ways. They are the smallest birds, typically weighing 0.1 -0.3 ounces. That’s as much as a nickel on the low-side and a quarter on the high-side. As acrobatic as they are beautiful, hummers rotate their wings in order to hover for extended periods of time while feeding as well as to fly forward, backward, up, down, side-to-side, and even upside down. Finally, the name hummingbird comes from the sound their wings make when they flap them an average of 70-80 times a second and dive at speeds of up to 60 miles an hour. 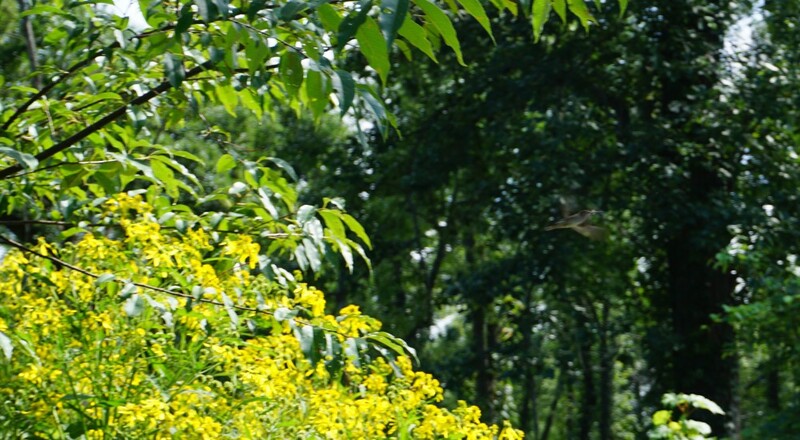 As summer wains in Crow Island Woods, you’ll have to look quickly to see these rapid flyers before they begin their long migration south.